A simple typographic rule states: if it doesn’t look right, it isn’t. 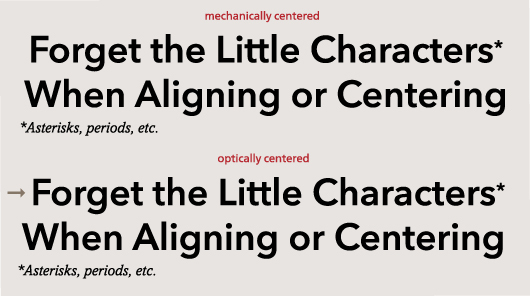 Anyone setting type can increase its readability by making manual adjustments to alignment. Making things “look right” typographically, often requires overriding mathematical accuracy with optical correctness. Let's start with the basics: Type designers draw individual letters with optics in mind. For example, round letters like the O and C are drawn mechanically larger than squared-off letters like the E and H, so that they all appear to be the same height. Similarly, the horizontal strokes of letters are rendered lighter than the vertical strokes, to keep them from actually looking too bold. The examples are myriad. Why are optical considerations so important? Anything that detracts from the smooth, even flow of the normal reading process makes graphics both less appealing and more difficult to read. It can even impair reader comprehension. So optical correctness is important not only to create a visually appealing piece, but also to reinforce understanding of the message. Optics are a factor in both text and display typography. In text sizes, large areas of white space and overall character fit (tracking) are the main concerns. (Character kerning is the subject of its own article.) As types size increases, individual words and even individual letters deserve consideration as important elements. Edge alignment is key to achieving visual correctness in graphic communication. Edge alignment should take into account the shape of the first, and sometimes the last letter in a line of display type. 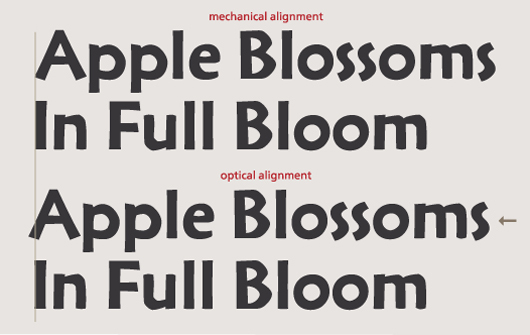 The optical, rather than the mechanical, edges of letters must be considered when aligning or centering display lines. Just as typeface designers draw round letters larger to make them appear to have the same dimensions as squared-off letters, round characters will look indented if they are not optically aligned outside margins. The same holds true for letters like the A, V, and W, which have diagonal beginning or ending strokes. Aligning the outermost portion of the diagonal with a left margin will make the character appear to be sitting inside it. Centering lines of display type presents similar problems – but the concern is with the shapes of the letters on each end of the line. Again, round letters and those with diagonal strokes can cause mechanical alignment to look misaligned. Centering display type over text with a ragged margin can also cause optical alignment issues. The partially filled lines of the text block can make the headline appear off-center. Column heading tables are susceptible to the same issues. Some characters are best ignored when aligning or centering. Periods and commas at the end of lines are normally omitted from consideration when centering lines. Characters such as asterisks and small dollar signs may also need to hang outside the margin in order for the line to appear properly aligned.